Taking advantage of the scheduling of a single mid-week JFL fixture, surprise package Sagawa Kyubin Osaka have issued perhaps their strongest claim yet that their title aspirations are to be taken seriously. No longer can the division be regarded as a two-horse race, with only Honda FC and Rosso Kumamoto potential winners. 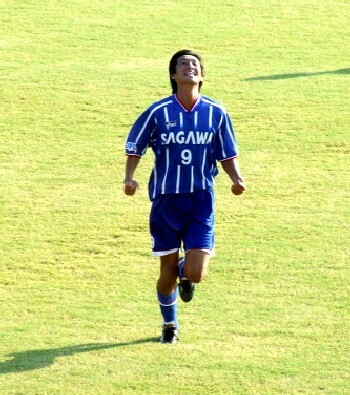 For big former Thespa Kusatsu forward Sho Gokyu notched up no fewer than five goals, taking his season tally to twelve as Sagawa crushed JEF Club 6-0 at the company's Moriyama Stadium in Shiga prefecture. This result means that they now have three consecutive wins with no goals conceded, and aside from matches against YKK AP and a potentially crucial last game of the season at home to Rosso, the run-in looks to be extremely straightforward. Current leaders Honda, on the other hand, have a far tougher-looking set of games, of which only five of twelve are at home, and although the JFL newcomers from Kumamoto will be optimistic that they can close the four-point gap between themselves and the frontrunners, Sagawa Osaka - who boast the best defence in the league - surely cannot now be discounted.